Have you seen Fallout at Ebling Library yet? If not, here's your chance! On Thursday, February 7 from 5:00-6:00pm, Ebling is hosting a viewing of the exhibit in its Historic Reading Room. 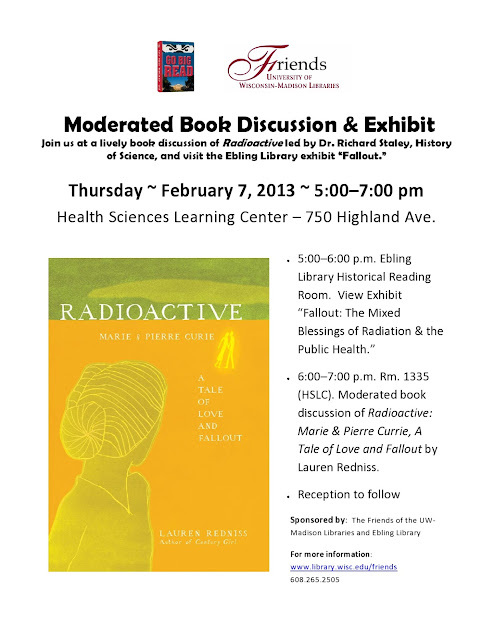 And as if that's not enough, History of Science professor Dr. Richard Staley will be holding a moderated discussion of Radioactive from 6:00-7:00pm. It's a perfect double dose of science-y goodness! For more information, see the flyer below.